The Supreme Court in an interim order while keeping in mind the demand for iron ore has permitted the state run NMDC to operate two mines in Bellary district. The NMDC which has been granted leases by the state and also which finds a mention in the Lokayukta report pertaining to lease violations was today permitted by the Suprme Court to extend the production of iron ore to the tune of one million tonnes per month from tomorrow onwards. The Special forest Bench headed by Chief Justice S H Kapadia while passing this interim order however maintained that this order does not apply to private owners and the ban on mining in respect to them shall continue. The interim order also states that while mining would be permitted for the NMDC, no part of the ore shall be exported. Further the Bench also directed the Karnataka government to levy royalty of 10 percent of the value of the iron ore. The Supreme Court also directed a macro level environment impact assessment be undertaken by Indian Council of Forestry Research and Education and directed that the report be submitted in three months. In addition to this it also sought details about the rehabiltation package for Bellary in three months. CBI probe- the Supreme court also adjourned hearing on an interlocutary application seeking a CBI or SIT probe into illegal mining in Karnataka. Senior Counsel Prashanth Bhushan said that the application while seeking a CBI or SIT probe also takes note of the latest Lokayukta report. The matter is expected to be heard next week. Groping in the dark would be the ideal term to use when one speaks about the investigations into the July 13 serial blasts. While the police continue to look for leads emerging from Indian modules run by the Indian Mujahideen, the rest of the agencies which are involved in this probe are looking very closely at an underworld link into the case. Two very crucial aspects are missing in this case-one a motive and another the use of technology. Investigators say that they are yet to find out what the motive behind this attack could have been and this is making the job even more harder. While the ultimate motive is destruction for every terror related incident, they are unable to find what could have led to carrying out such a task. The other aspect is the use of technology which has been virtually zero while executing this attack. Groups such as the IM are specialists when it comes to the use of technology and while police found it hard to crack that at first, it was technology at the end of it which eventually cracked the case for them. Sources say that the group has relied on the word of mouth concept and hence there are absolutely no traces what so ever in this incident. A source in the Intelligence Bureau pointed out that as of now there is no lead at all. There is nothing to show that any of the modules around the incident were active. What we do see is that there is a slow exercise involving re-grouping, but none of them have shown any signs of carrying out an attack at the moment. While this is the scenario where the IM is concerned, the underworld link is the next aspect to the investigation. Once again investigators have failed to find any motive as to why the underworld would carry out such an attack. However the police are in touch with their informers and also small time operatives to find out about any specific information or movements. Mohammad Zaid who was arrested in Nepal a couple of days back has failed completely to provide any information with regard to the case. He has not been given a clean chit, but there is every indication that he had no information regarding these blasts. The Indian agencies are still coordinating with their counterparts in Nepal to get more information, but it appears to be a damp squib and Zaid appears to have no information what so ever. While the forensics have managed to give the police a fair idea as to what the bomb composition was, this too has not been of much help. Unlike four years back, the police are unable to tell the signature on the basis of the bomb composition any longer since every group small or big have been aping one another regarding the composition. They have also not been able to tell as to where the material has been sourced from and this is primarily because the attack was carried out by a very small group involving hardly ten people. Sources also say that the CCTV footage which was so heavily relied upon also has not given any clues. These men who planted the bomb have not hovered around for long and have made a quick exit after planting the bomb which is one of the reasons why even the sketch prepared by the police had given no leads. Intelligence agencies say that this is a relatively new phenomenon and in future too you may get to see attacks where very small modules are used to carry out attacks. Terror groups have realized that the larger the network they use the bigger the chance of them being traced and hence the new face of terror in India will come from fringe groups which will execute attacks with a handful of people. Will Hyderabad be made free zone? With the students and officers association of Telangana calling for a bundh on Monday, the government of India is toying with the idea making Hyderabad a free zone. There has been a great deal of confusion regarding the issue pertaining to Article 14 (f) of the Constitution and there has been a demand that Hyderabad is no longer a free zone. When one says free zone it means that the people from the rest of Andhra Pradesh will be able to get government jobs in Hyderabad, but it would be quota based. At the moment there is no restriction and once this order is removed things would be different. For starters for a person from Andhra and Rayalseema to be eligible for a job provided he has stayed in the Telangana region for more than four years. Secondly they would entitled only to 15 per cent of the jobs in the government sector. However a great deal of confusion has been caused with the Home Minister issuing a statement in which he said that the Andhra Pradesh legislative assembly needs to pass a resolution regarding the formation of Telangana and also the issue of 14(f). It is nothing but a delay tactic, the activists of Telangana allege. For starters it is not the state government which should be passing a reselution regarding the formation of a state and secondly the issue of 14(f) has already been discussed in the AP legislative assembly and the leaders have unanimously resolved last year to make Hyderabad a free zone. This statement by the Home Minister has also caught the Chief Minister of Andhra Pradesh, Kiran Kumar Reddy unwares. He is said to have conveyed to the union government that a resolution regarding 14(f) is already in place and why would the Union Government want another resolution regarding the same. Moreover it is also argued that the reselution passed by the AP assembly last year still holds good and there is no need for a fresh resolution since the assembly is very much in place and has not been dissolved. As the protests in Hyderbad and districts in Telangana continue, the activists are pinning their hopes on the parliament session to be held today. They expect that the issue is discussed and sources also say that the Home Minister who is looking into this issue has sent the file to the Prime Minister. Indications are that there may be a quick decision on the issue of 14(f). Although this may bring some relief to those fighting the issue, they would still continue to put pressure until the statehood is granted to them. Meanwhile, the Congres leaders from Telangana are holding out until the speaker of the AP assembly returns in another day or two. They say they will resubmit their resignations only once he returns. However they have been abstaining from Parliament and some even allege that they are under immense pressure from their high command to attend parliament. The activists however say that in the days to come these MLAs and MPs will come under a lot of pressure and the road ahead for them will not be one bit easy. Author Vicky NanjappaPosted on August 5, 2011 Categories TelanganaTags Andhra Pradesh, Article 14 (f), Free Zone, Hyderabad, Kiran Kumar Reddy, Rayalseema, Vicky NanjappaLeave a comment on Will Hyderabad be made free zone? People call it the Republic of Bellary. Flouting of norms, use of official power to earn unimaginable amounts from illegal mining is nothing common in Bellary which around 400 kilometres away from Bangalore. With a new Chief Minister taking over in Karnataka, people will keenly watch the formation of a new cabinet and the big question in the minds of the people is will the Reddy brothers make it or not? The Lokayukta report which claimed the head of B S Yeddyurappa digs deep into the activities in Bellary and on several ocassions, it has recommended that Gali Janardhan Reddy should be kept out of the cabinet and here is the reason why such a recommendation has been made. Chapter seven of the report on illegal mining titled Associated Mining Company- A pool of Illegalities is not only shocking but spells out clearly how official power has been flouted to bring in the riches illegally. The report states that the title pool of illegalities is very apt in this case and the facts of this case state how people in power could misuse their offices and manipulate the law and executive to their advantage. The Associated Mining Company was granted a mining lease for a period of 30 years on March 2 1966 and as per the conditions it was permitted to mine in an area of 16.9 hectares in Venkatagiri village of Sandur taluk, Ramghad forest block, Bellary district Karnataka State for winning of iron ore mineral. The lease period expired on March 1 1996. After the expiry the first renewal was effected on March 24 2000. This means that there was a gap of four years between the expiry of the lease and the first renewal in the year 2000. Hence there was no continuity for this renewal. Justice Santhosh Hegde in his report points out that the first renewal is in vilation of the Mines and Minerals Act and there is no approval from the central government for this deviation. Moreover the then minster for Mines in Karnataka, V Muniyappa had approved this renewal contrary to the recommendations of the Secretary, Mines. The then Director, Mines has submitted incorrect information to the Government of India regarding the facts of lease period and its renewals. The report shows that the mining lease granted in favour of Associated Mining Company is since been taken over presently by all together new managing partners through back door entry to overcome the law. The new managing partners are Lakshmi Aruana and G Janaradhana Reddy. Janardhan Reddy and Lakshmi Aruna formed part of the management in the year 2010 after which they opened up an account in the state Bank of India, Bellary which again was not intimated to the Commercial Taxes Department for the collection of VAT. Instead the old account no. 1425201000179 of Canara Bank, Bellary has been reported to the Department while having new registration for VAT. The then Director, Mines Shivalinga Murthy has approved the issuance of MDP without taking approval of Central Government for transfer of rights or interest to new managing partners. He is not a Competent Authority to do so. In the new account of AMC in SBI Bellay a/c no. 31000313003, there is a debit 269,15,73,602.00 and credit of Rs. 270,60,93,762.00 after 01-08-2009 to 08-02-2011. There are many huge transactions in the said account. The transaction gives the linkages between the Associated Mining Company and other companies/firms/individuals. There is credit of Rs. 14,00,00,000.00 (Rupees Fourteen Crores) from Janadevi Minerals on 31-05-10 and 19-07-10 in the account of AMC. There is no permits issued as a party/purchaser from AMC. The Janadevi Minerals is also a front company/firm of ILC. Likewise, Rs. 34,15,00000.00 (Rupees Thirty four crores fifteen lakhs) have been credited from the account of Lakshmi Aruna Minerals on 25-06-10, 31-07-10, 20-08-10 and 30-08-10 in the account of AMC (SBI 3003). G. Lakshmi Aruna is the Managing Partner in both firms. There is another credit of Rs.3,00,00,000.00 (Rupees Three Crores) on 07-05-2010 from HDFC Bank of Eagle Traders and Logistics. There are more transactions of this kind in this account. The money has been credited to this account through circuitous route. This indicates illegal activities of AMC in collusion with other companies. It is pertinent to state here that royalty has been paid from the bank account of AMC (SBI, Bellary A/c no. 3003) to get issue MDP of the BRY Mines ML. No 2186. An amount of Rs. 96,80,000.00 and Rs. 87,44,000.00 have been paid in the form of Demand Draft favouring Deputy Director, Mines, Hospet. The permit numbers 5771884 dt. 22-05-10 and 571740 were issued. The permits were issued to transfer iron ore from BRY lease to JSW and Lakshmi Aruna Minerals has been stated as purchaser. As observed, the lease of Yogendranath Singh that in the said lease there was no iron ore available. Hence these permits were used in proxy to transport iron ore from unknown source. Further there are debits from this account (SBI 3003) to Sri Bhakta Markandeshwara Minerals (SBMM) (Axis 2669), Divakar Minerals, JJ Impex, Shantha Lakshmi Jairam, Brahamini Industries, Vijay Mining Infrastructure and many others. The trail of huge amount in this account (SBI 3003) is allegedly linked with the illicit removal of ore from various mines. 900 transit permits have been issued after expiry of lease period. This is a blatant misuse and action should be initiated against the concerned Foresters, Range Forest Officer and Deputy Conservator of Forests, Bellary. The lease expired on 23-03-2010 the validity of the permits also expiries accordingly. Hence iron ore supplied from 24-03-2010 is illegal and unlawful. The quantity of 3,03,573 MT of iron ore supplied since 24-03-2010 to JSW by Associated Mining Company is illegal. There are no permits, AMC as a party, were issued from Deputy Director, Mines, Hospet and Deputy Conservator of Forests Bellary. It is presumed that either the mining activities continued after the expiry of lease period or the iron ore was supplied from unknown source. The market cost of the entire quantity of 3,03.573 MT iron ore should be recovered from the lessee with exemplary penalty. Further any other legal action should also be initiated. The Deputy Conservator of Forests, Bellary has issued transit permits on 22-03-2010 for transportation of 80000 MT iron ore from the lease in two days. This is misuse of power and authority without application of mind. The Deputy Conservator of Forests has shown undue favour and facilitated illegal mining activities. Action should be initiated against the then Deputy Conservator of Forests, Bellary. The Deputy Conservator of Forests has issued an order dated 22-03-2010 for deputing 17 foresters in addition to the already engaged for the purpose of issue of Form no. 27. All the foresters were called at the Range office and asked to sign the Form no. 27 sitting in the Range forest office. The transit permits were signed in the Range office under threat as confessed unanimously by them. This is nothing but misuse of authority and powers. Further there is hardly 10 million tons iron ore reserve left out in the leased area and with the present rate of production it will last for another 9- 10 years only of the grade 60 plus. The recommendations at the end of this chapter call for stringent action against all those involved in this episode. However the strongest recommendation is against Janardhan Reddy- “in view of the misconduct of Janardhana Reddy, Minister, noted in this Chapter, I recommend to the Competent Authority for his removal from the Cabinet. There appears to be no respite in Karnataka. The Jagadish Shettar faction which was beaten by the Yeddyurappa group in the secret ballot yesterday will be going to New Delhi tomorrow with a long list of complaints. Members of the Shettar faction say that there was more than what met the eye at the meeting yesterday. It should have been a clear victory for Shettar as he had the numbers. However moments before the members could arrive at the venue some of the MLAs were threatened with dire consequences by the Yeddyurappa faction members. Some of the MLAs yielded to this threat and voted against Shettar the members alleged. Further they will also complain to the senior leadership in New Delhi about the manner in which the meeting was conducted yesterday. They allege that the proper rules were not followed. The Shettar group was infact very confident and a day before the crucial meetings, Shettar’s office had even sent out photographs of the leader anticipating that the press may need his pictures once he becomes the Chief Minister. Shettar himself was confident and even claimed publicly that he was in with a very good chance. However the bigger issue is that this faction is worried about losing out on plum portfolios to the Yeddyurappa faction. They will be seeking the intervention of the senior leadership on this matter. This is one of the main reasons why this faction stayed away from the swearing in ceromony today. Sadananda Gowda addressing his first press conference after being sworn in as the Chief Minister of Karnataka says that there is no need to read too much into the allocation of portfolios and the issues will be sorted out amicably in around four days. Stop calling me a rubber stamp, wait another month you will know what Sadananda Gowda is. I will consult with my national leaders and take a decision along with all the rest of my party colleagues, the CM of Karnataka also said.On the comment by Yeddyurappa that he will return as the CM in the next 6 months, Gowda said that it was an opinion expressed by him and would not say much about this. However if Yeddyurappa feels that he will return as the Chief Minister, then there is no harm in him thinking in this way. He played down the rift with Jagadish Shettar and said that we are very much together and things are cordial between the two of us. We had spoken with each other this morning and there is no problem between us. He also added that there was no need to read too much into the secret ballot that was held yesterday. It was a democratic process which the BJP has followed and this process of selecting a leader will go down in the history of India. 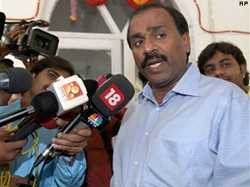 Gowda had his moments during the press conference when he answered a question in Malayalam and said that he has a close connection to the state of Kerala. I was the incharge of that state for the party and hence I am attached to it. On the Lokayukta report on illegal mining, he said he will need some time before he can comment on the same. I need to study the report and only then can I comment on the same he added. I will ensure that Karnataka will head in a new direction under his leadership. I will take into confidence not only my party colleagues, but also the leaders of the opposition in order, Gowda also pointed out. Further he said that the media should play a constructive role and help better the administration in the state. Give me all your support and I will take your suggestions. Celebrations are over and now time for work. Sadananda Gowda leaves for the Vidhan Soudha to his office. He will address the media at 5 and then he has his task cut out. The most important of them being pacifying Shettar and company. 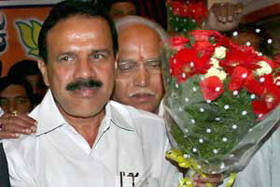 D B Sadananda Gowda has been sworn in as the Chief Minister of Karnataka by Governor H R bhardwaj. No prolonged speeches and the swearing in was complete in less than a minute. The Yeddyurappa faction is present in full strength at the Raj Bhavan even as the clear split in the BJP is very visible. There is dancing outside the Raj Bhavan by Gowda supporters even as the members of the Shettar camp continue to sulk at their homes. Sadananda Gowda has arrived at the Raj Bhavan and will be sworn in as the Chief Minister of Karnataka. He is now accompanied by a very dull looking K S Eshwarappa who made a last minute entry even as Shettar and others hold out and have not come in as yet. Some peace for Sadananda Gowda as K S Eshwarappa arrives at Raj Bhavan. Sadananda Gowda has just left for Raj Bhavan to be sworn in as the CM of Karnataka. The rivals have not budged as yet. Raj Bhavan has a very small crowd. The rivals are holed up in the houses of Jagadish Shettar and K S Eshwarappa. Their demand- let the high command decide on who gets what ministry. Gowda however says let us decide here. But Shettar says if you decide your faction will walk away with the plum posts. There is trouble in the Karnataka BJP yet again. The big question is whether the Jagadish Shettar camp will take part in the swearing in ceremony and till we last heard from the BJP’s inner circles the rival camp is threatening to boycott the function to be held at the Raj Bhavan at 4.30 PM. Hectic efforts are on to pacify the Shettar faction to arrive at Raj Bhavan and participate in the function, but there have been no positive results as yet for the Yeddyurappa faction. Sadananda Gowda will assume charge as the Chief Minister of Karnataka. He has a tough task ahead and ironically that task ironically is not the administration of the state, but it is to keep the BJP flock in Karnataka together. The man is all smiles and the excitement is clear and despite every third person in the state saying that his rival faction will pull him down, he still maintains that he will sail through everything and do his best the remainder of his two year term as Chief Minister of Karnataka. In this interview with rediff.com, Sadananda Gowda who will be sworn in as the Chief Minister of Karnataka at the Raj Bhavan at 4.30 PM says, troubles will come, but I am confident that I will solve every problem that comes my way. More importantly he says with that very famous smile of his that he will be anything but a proxy Chief Minister at the hands of B S Yeddyurappa. Sir, what are your immediate reactions after taking over as the Chief Minister of Karnataka? I am happy and everyone around me are happy. Were you always an aspirant to the post of Chief Minister? I take what life gives to me. I do not expect anything and crave for anything. What ever challenge is thrown to me, I do to the best of my ability. A couple of years back I was made the president of the state Bharatiya Janatha Party and this position too I had not expected. The post of the Chief Minister too I had not dreamt of and now that it has come, I am happy and want to do my best. The biggest talk however is that you will be a dummy at the hands of B S Yeddyurappa who pushed heaven and earth to ensure that you were selected as the Chief Minister of Karnataka. Yes I have been hearing all that too. There is nothing wrong in senior leaders supporting my candidature. This is a responsibility that has been given to me and I shall do my best. I will not be a proxy Chief Minister for sure. You are sure to face a lot of hurdles and the main one would be your rival faction trying to pull the carpet from under your feet. Do you think you will complete your term? I am hopeful that I will complete my term although there are a lot of challenges ahead. I am confident that I will succeed at the end of it. On one hand you will need to cater to the Yeddyurappa faction and on the other work along with the Shettar faction. Will you be able to do it? Yes why not. I have faced many hurdles in the past and with the support of the party workers and my colleagues I have managed to get away with it. But all of you will have to give me sometime before I figure things out but be rest assured everything will fall into place. So what will be the secret to tide through this hurdle? According to all of you I have a famous smile, I am sure this will carry me through. There is talk that the rival faction will boycott your swearing in. Are you in good terms with Jagadish Shettar? There is no doubt that they will participate in the event. I have no issues with Shettar it is all created. So will he and his faction be part of the Cabinet? Now is not the time for that. These things take time since there are discussions that are involved in it. Everything will be sorted out for sure. What about the report on illegal mining? I do not want to say anything about that and I will have to seek a legal opinion on it. I will answer this question in a couple of days, but not at the moment. I will need to assume charge first and then look into all this. Will you be able to keep the entire BJP flock together? I am confident of that. I have the support and blessings of all my colleagues and they will help me do a good job in my new role. I do understand that the challenge ahead will be tough, but I am confident of coming out victorious. Will the Bharatiya Janata Party in Karnataka remain united? Seeking a further probe into the issue of illegl mining following the report by the Lokayukta of Karnataka, an interlocutary application has been filed before the Supreme Court of India seeking an investigation through the CBI or SIT under the supervision of the court to probe all aspects of illegal mining in both Karnataka and Andhra Pradesh. Further the application before the court also sought investigation by either of these agencies to probe the collusion of public servants and reprsentatives with the mine owners in Andhra Pradesh and Karnataka. The petitioners, the Samaj Parivartan Samudaya state that there is large scale illegal mining in the above mentioned statesparticularly in the districts of Bellary, Chitradurga and Tumkur. There has been a serious breakdown of governance in Karnataka state on account of the nexus between politician-miners and officials which not only raises serious concerns about ecology and environment, but also on issues concerning transparency and accountability in the functioning of the Government. The petitioners brought to the notice of the court that anorder had been passed on January 1 2010 in which the matter was referred to the Central Empowered Committee (CEC) which in turn filed two reports in which the issue of illegal mining was dealt with in detail. The petitioners also bring to the notice of the court that the government of Karnataka had made a referrence to the Lokayukta of Karnataka who in turn had put out a report which was also placed before the court. Now the Lokayukta has submitted the second part of his report and the petitioners say that this report is a scathing indictment of the entire “state” machinery– forest dept, mining and geology dept, transportation dept, state police etc. – and encapsulates the systemic collapse that have happened in the region. The said report brings out how the rule of law has ceased to exist under the all pervasive business-political-bureaucratic nexus which has allowed large scale illegal mining in forest areas at highly unsustainable levels. The said Lokayukta report particularly deals with the districts of Bellary, Tumkur and Chitradurga where the Lokayukta and Chief Conservator of Forest found large-scale illegal mining and violation of lease conditions. The petitioner further submits in the application that in the second part of the report the Lokayukta mentions that no action was taken on the first report as a result of which illegal mining continues to exist. As a matter of fact…illegalities in mining have increased and there is total failure of supervisory machinery in controlling all the above illegalities/irregularities. The Lokayukta report also brings out the unsustainable nature of the mining in Karnataka. It states: “It is shocking to note that the most of the leases will be running out of deposit of iron ore…in a span of 3 to 12 years. The consent approvals from the MoEF and also the IBM have been increased irrationally without keeping in view the total deposition of the ore in the leases and environmental damages. This unscientific and unsustainable extraction has caused a serious concern, the petitoners also state while quoting the report. Further they submit that the second report of the Lokayukta also shows in great detail the offences under the Prevention of Corruption Act, Indian Penal Code, Income-Tax Act, Mining laws, Forest Conservation laws have been committed by various entities including top politicians, public servants and big companies. The Lokayukta has decoded the entire maze of financial transactions, lease deeds, sale deeds, maps, reports of forest dept, reports of mining & geology depts., encroachments, transport permits etc. and has brought forth the large-scale violation of laws by various specific entities. The said reports also names the Chief Minister, sitting ministers, senior politicians, top public officials and also top companies like Jindal Steel and OMC, state and central public sector units, for committing various kinds of illegalities which are also serious offences. Most of these transactions are absolutely clear instances of quid pro quo amounting to a serious offence under Prevention of Corruption Act. It is to be noted that CBI is already investigating the mining scandal on the adjacent region of Bellary Reserve Forest which falls in Andhra Pradesh and the same officers can easily investigate the illegalities in Karnataka. Under these circumstances, when the involvement of CM and top ministers is established, when big companies are involved and situation of systemic collapse is noted, it is extremely essential in the interests of rule of law to launch prosecutions and credible investigations on the basis of the reports of the Lokayukta and also the CEC reports. This cannot be done of the state government and the state police which are under the control of the same forces that have allowed this grave situation to develop. Hence it is in the interest of justice that the court orders a CBI or SIT investigation, the petitioners say through their advocate Prashanth Bhushan. Alls well that ends well- that is the picture you get at the end of it when you look at what trascribed in today crucial BJP meeting that ended with the selection of Sadananda Gowda as the Chief Minister of Karnataka. One of the MLAs who was present at the meeting today said that everything was not hunky dory as it may have seemed in public. The day began with meetings between both the factions- Ananth Kumar and Yeddyurappa with the senior leaders from New Delhi. All through the leaders made an attempt to bring about a consensus, but failed. The two factions even arrived at the Hotel Capitol seperately. The Ananth Kumar faction comprising Jagadish Shettar and the rest arrived in two buses of the Karnataka State Road Transport Corporation. It was around 11.40 by the time these factions had arrived. At this point of time, the Yeddyurappa faction had not arrived as yet and they were still holding talks with the Rajnath Singh. At around 12 four buses of the Siddaganga travels arrived at the hotel with Yeddyurappa’s supporters in it. However only the MLAs were allowed inside and the MLCs and MPs were kept out and fifteen minutes later we got to see a sulking MP, D B Chandre Gowda storm out of the hotel. It was almost 12.30 by the time the meeting started and what was expected to be a peaceful discussion turned into a heated debate. The leader who was present at the meeting said that both factions hurled allegations at each other. It took quite some time for the national leaders to address the MLAs. The Yeddyurappa camp started shouting slogans in favour of Gowda and when they went quiet, it was the turn of the other faction supporting Ananth Kumar. Then followed a volley of allegations against each other and it almost came to turning ugly, but then both Jaitley and Rajnath made an emotional plea to both the parties to stay calm. Both of them said that all of you have worked so hard in building this party from scratch and do you want to ruin it by fighting among each other. We have come from Delhi with a decision in mind. We would want Gowda to be the Chief Minister and Shettar as the Deputy. This created yet another round of commotion with the Shettar camp demanding that there be a secret ballot since they beleived he had the numbers. The Yeddyurappa faction however said that there is no need for a ballot and they should go ahead with the decision that has been taken. We have the numbers the Yeddy camp said and we do not see the need to go through this process. However the real problem for the Yeddy camp was that they were afraid that there would be cross voting and hence they tried to go along with the decision instead of insisting on a secret ballot. However the Shettar faction was adamant and insisted that a secret ballot was held. When the national leaders finally agreed, it was Suresh Kumar, Law Minister who stood up and said that he would not vote. I belong to the BJP and not any of these factions and hence i do not want to be identified with anyone. While he earned an applause, that lasted a short while and the MLAs went ahead with the voting. It was a matter of time before the results were announced and Gowda was elected as the new leader. Although there was disappointment in the Shettar camp, they remained quiet. It was by this time, the grin on the face of Ananth Kumar had turned into a frown since he was unable to ensure that the candidate from his faction went through. Just before the votes were counted, Yeddyurappa went up on the stage and proposed the name of Gowda. Surprisingly both Shettar and K S Eshwarappa who were aware of what the result would be seconded Gowda’s name. At the end of it there were pleasentaries which were exchanged and each one promised to work for the betterment of the party.